WHAT IS YOU WARRANTY ON YOUR CUSTOM PRODUCTS? WHAT CURRENCY IS YOUR SITE SHOWN IN? Our site is all in Canadian Dollars. Your credit card company or paypal will convert to US dollars if you are shopping from the United States. WHEN CAN I EXPECT MY DRAPERY TO BE DELIVERED? The current estimated time for shipping is listed in our notes on the product pages. There are occasionally delays on fabric stock but if this is the case we will let you know within 2 days of order placement. To the best of our ability your order will ship as one shipment but sometimes circumstances out of our control do cause us to have to split orders into multiple shipments but we will advise you of this whenever possible and you will be notified of shipment by the courier system when we ship your order. WHAT SHIPPING COMPANIES DO YOU USE AND WHERE DO YOU SHIP? Good news! Shipping is always FREE on most items to Canada and continental USA (exceptions for window seats and drapery poles which carry an overage surcharge of $100). We use UPS within Canada and DHL to the USA and the rest of the world. We are happy to ship anywhere in the world so please email us a brief description of the size of your order and we will custom quote the shipping cost for your country and this will be charged after your order is placed and paid for, we will take an additional shipping payment by phone or email – email us today for a worldwide shipping quote! PLEASE NOTE: Any duty or taxes are payable by the customer to DHL when products ship to the USA. Once product leaves our facility the average time to it’s destination is 5 business days. When items are shipping across an international border they must clear customs and this can sometimes cause delays that are beyond our control so please be aware of this when ordering. All of our products are custom made just for you and thus we do not offer returns, refunds or exchanges. If you have an issue within 2 days of receipt of your product that pertains to manufacture we stand by our product and are happy to help you resolve it! All sales are final. 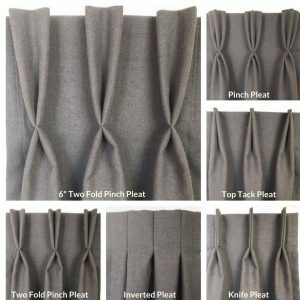 WHAT DO THE PLEAT STYLES LOOK LIKE? WHAT ABOUT CHILD SAFETY AND ROMAN SHADES? HOW DO I MEASURE FOR PERFECT DRAPERY AND SHADES? Sometimes our shades need a little extra love when they arrive. Here are links to videos to help!